Since our founding in 1998, the management of Pro Metal Works has been committed to providing an error-free product to all of our customers. We continue to meet or exceed part specifications and our customer’s expectations on each order. We have thorough documentation and procedures based on ISO9001:2008. Our comprehensive and detailed quality plan is followed and regularly reviewed to ensure the highest possible standards are maintained. We have a quality manual with documented procedures. Our Quality Policy is dedicated to continuous improvement and customer satisfaction. We are up to date on the most advance forms of PPAP processes, FMEA, Control Plans, SPC measuring. 1. All incoming orders are thoroughly vetted through our APQP process for Rev changes, drawing discrepancies, price inaccuracies, and cost improvements. 2. We create routing folders, and our quality and process engineers create shop drawings and inspection documentation highlighting critical dimensions for each operation. 3. At each work-center each operation goes through a rigid quality inspection process to ensure part accuracy. All flat profiles are inspected through our Virtek Laser QC. This will insure proper adherence to customer provide cad files to within +/-.002. 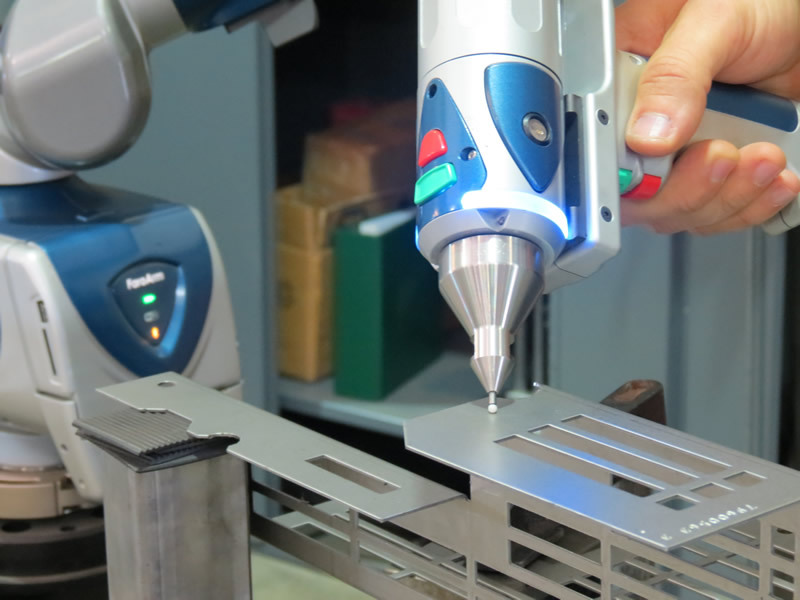 The Virtek is a key piece of inspection equipment quality that allows us to inspect the first article part before laser cutting or punching additional parts. The LaserQC system has an accuracy to +/- 0.05mm (0.002"). 4. Upon completion of all fabrication processes, a comprehensive inspection of the finished part is completed. This final inspection may employ the use of our FARO CMM measuring device operated by dedicated, full time, inspection personnel. At Pro Metal Works, producing quality parts is no accident. It is the culmination of the orchestrated accomplishment of our: engineering staff, skilled craftsman, dedicated inspectors, and use of the most technologically sophisticated fabrication and inspection equipment available.